Bazillions of Post- It Note Projects - C.R.A.F.T. And by bazillions, I mean as many as I can round up! Post-It’s are a fun, versatile, inexpensive craft medium that everyone has on hand. Did you know that you can print on Post-Its? True! And make pinatas, and planners and don’t even get me started with all of the Post-It teacher ideas! I have a Pinterest board dedicated to Post-It Projects (all with good links, of course). 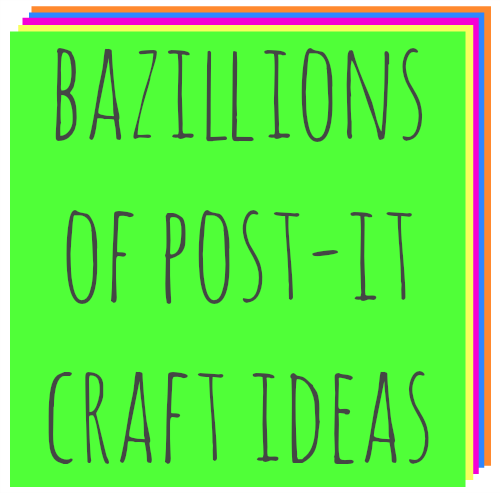 Just click that board and follow along to see bazillions of clever Post-It crafts and projects… the list will continue to grow and grow! Have you made a Post-It craft or project that is not on the Crafting with Post-It’s board? Leave me a link on this blog post, and I’ll add it! After all, my goal is to collect bazillions of Post-It note ideas… and a bazillion is whole heck of a lot. And in other crafty news, my blog friend, Amy, started a new site all about washi tape. It’s called Washi Tape Crafts! Oh, there are some fun projects! Good thing that my local stationery shop just had post-its in sale!